Will this games be actual also in 2017? Will savate be there? Muay thai and kickboxing put all efforts to be IOC recognised and to come to ARISF and then to World non-olympic games: Wroclaw, Poland 2017. It seems that IFMA and WAKO in their strategy work together. Both organisations were accepted in Sportaccord at the same year 2006. At the same year 2012 they both asked IOC to be recognised in ARISF and they both targeted World non-olympic games: Wroclaw, Poland 2017. Is IFMA and WAKO friendship in their connected tactics something we should expose more radical? In many world countries they have the same national federation representing both WAKO and IFMA and the same people from these national federations compete for both systems in the same year. Do you think that Sportaccord and IOC was that stupid not to see that Thaiboxing is the same activity as Muay thai and all accusations from both sides was just a big game. So the victims are blind Sportaccord in 2006 but this year the new president will take the responsibility of the old one, and almost half-alive ARISF will recognise IFMA and WAKO in the same combination as 7 years ago. And where is savate and his early olympic games 1900 and 1924 and ARISF recognition and then also World games? RUSSIA: Did anybody hear of this man? Andrey Lisay - who is he, nobody in International savate federation don't know nothing about him and these strange kali/arnis techniques? And this is Parisian gala. Didier Buch - thank you. The biggest problem is when you don't have a dress ... We present you Polish national cadets sumo championship 2011. USA: Nicholas Saignac - is he in FISav? Is this man still part of FISav - International savate federation? A little bit of kickboxing, a little bit of false techniques but in the end a savate tournament with savate judges and rules. Not in the FISav or european savate confederation calendar. But a good step forward to OPEN pre-combat under 21 years championships. NO WAY FOR SAVATE ON A FRANCOPHONE GAMES 2013 IN FRANCE, NICE. SAVATE IS JUST A NATIONAL FRENCH SPORT FOLKS. and savate ambassador is who? The WCG 2013 Sports Ambassadors represent International Sports Federations and are appointed for a special and a very noble assignment – to become a symbol of the Sport. Sports Ambassadors will be engaged in promotion of their sports and the world of martial arts & combat sports as a whole via press-conferences, TV & radio interview sessions, and publications in International and Russian newspapers & magazines. The special issue of the TV-magazine “World of Martial Arts & Combat Sports” will be focused on the life stories of WCG 2013 Sports Ambassadors. - International Forum “The World of Combat Games and Society’, with participation of Ambassadors of Sports, IFs, youth, NGOs, athletes, government representatives, combat sports organizations. Stay tuned to find out who will be selected as WCG 2013 Sports Ambassadors! Not long ago we introduced you to the updated statistics of the II Sport Accord Combat Games in our reports. The event will be held on October 18-26 in Saint-Petersburg (Russia). The organisers expect to welcome 2000 sportsmen, aficionados of martial arts and combats, from 150 countries of the world. Television broadcasts of the Games will be organised in 50 countries while the registration of all the willing on the official website of these competitions will begin already on May 1. All those who participate in the organisation of the martial arts festival gathered in Saint-Petersburg half a year before the beginning of the Games (April 16-19). They were technical delegates from international federations, representatives of Sport Accord, Ministry of Sport of Russia, All-Russia State Television and Radio Broadcasting Company (VGTRK) and IEC IN SPORTS television companies which are going to organise Russian and international broadcasts of the competitions as well as Swiss Timing which is responsible for television graphic and the accreditation system and preparation. So, let’s start with housing. Sambists at the Sport Accord Combat Games will live at the Pribaltijskaya Park Inn Hotel which is located on the coast of the Gulf of Finland, close to LENEXPO, largest exhibition centre of the northern capital. It is an up-to-date hotel with splendid rooms which have air conditioners, TV-sets, comfortable furniture and unlimited access to the Internet in every room. A part of the rooms overlooks the spectacular view of Saint-Petersburg and the Gulf of Finland. The organisers of the Games also thought over the energy demands of sportsmen which will be reduced to a minimum as the spacious rooms of the hotel will be transformed into training halls to insure comfort of all the participants of the competitions. In fact, the Pribaltijskaya Park Inn Hotel is just a 20-minute bus ride from the place where competitions in SAMBO, karate, taekwondo and wu-shu will be held. It is Spartak Basketball Club, a specialised basketball complex. Technical delegates from the international federations who visited Spartak with an inspection had to wear hard hats as the construction of the complex was not terminated yet and the final chapter will be closed only in May. It is clear even now that the complex will be equipped with all the things which viewers, sportsmen, coaches and journalists expect to see in such places , i.e. convenient parking area, vertical tribunes with great panorama, logistics, impeccable aesthetics and style of all the rooms as well as all the things needed for the work of representatives of the press. The decision concerning equipping the hall with a unified podium convenient for use for all the types of sport the sportsmen of which will perform at Spartak hall was reached at the meeting in Saint-Petersburg. It is to be recalled that competitions in SAMBO will open the programme of the II Sport Accord Combat Games in this hall and they will start on October 18. After settling and fighting … it is time to have a rest. Where will it be possible to do during the II Sport Accord Combat Games in Saint-Petersburg? It turns out that it is not far to seek. The Park Inn Pribaltijskaya Hotel offers all the guests to visit Waterville Water Park with waterslides, four pools and a bathing complex. The organisers who have prepared an ambitious cultural programme of the Games will entertain the guests too. Amateurs of Sport Science will have a chance to visit the VI International Congress “Sport, People, Health”. That's where the elite of Sport Science will present their unique reports with the answer to the question about contribution and place of martial arts and sports combats in the world of modern sport. It will be possible to find out more about those 15 types of sport which were included in the programme of the unique sports forum at the exhibition which will be held at the Pribaltijskaya Park Inn Hotel. A video and photographic materials, awards and medals, attributes and outfit of each type of sport will be presented there. In fact, nobody will have troubles with passports and visas at these competitions. Very soon Vladimir Putin, President of Russia, plans to sign a corresponding decree concerning visa-free entrance to Russia for all the participants of the II Sport Accord Combat Games in Saint-Petersburg. Therefore, all the participants will be able to leave their passports at home as it was during the Olympics and Universiades. A special accreditation of the Games will replace their passports. This is the news that was narrated to us by Sergey Tabakov, Executive Director of the International Sambo Federation and also FIAS delegate at the Games in Saint-Petersburg. You, our dear readers, can expect from us next pieces of news about the Games coming in October already in a month. It is May 26-31 when Saint-Petersburg will gather all the organisers of the Games within the framework of carrying out the Sport Accord Convention, major international sport event, in Northern Venice or Saint-Petersburg in other words. From May 11-12, the Italian Muaythai Federation will be holding an International Muaythai Open in Rimini. The event will be part of the prestigious fitness event known as ”Rimini Wellness,” which attracts around 250,000 visitors. The location will be the Rimini Fair Complex. 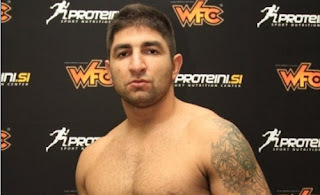 Giorgio Petrosyan, Armen Petrosyan and their coach Alfio Romanut may be special guests at the event. Ritorna a RiminiWellness il grande villaggio dedicato alle arti marziali e agli sport da combattimento. All'interno dell'area si terranno emozionanti dimostrazioni, spettacoli e stage organizzati da WTKA. Una rassegna densa di appuntamenti di grande rilievo per conoscere e appassionarsi a Karate, Kickboxing, Kung Fu ed All Styles solo per nominare alcune delle numerosissime discipline che troveranno spazio nel Martial Village. Ma l'importanza di questo appuntamento non si esaurisce nella ricchissima serie di dimostrazioni: i palchi del Martial Village ospiteranno infatti anche la finale dei Campionati Italiani Assoluti WTKA. A conclusione di numerose tappe lungo lo stivale lo spettacolare scontro finale sul palco di RiminiWellness eleggerà il Campione d'Italia: un evento assolutamente da non perdere! It is how worlds - army party in the middle of France. They also call it sports. And by the way - will savate as a French national sport profit from this NATO event? (ATR) International Rugby Board chairman Bernard Lapasset today announced his candidacy for the presidency of SportAccord. He will stand against Marius Vizer in next month's elections. Lapasset declared his candidacy in a letter sent to the 107 member federations of SportAccord and outgoing president Hein Verbruggen. Brett Gosper, general secretary of the IRB, said he had "the honor to nominate and propose the candidature of our President, Mr.Bernard Lapasset for the position of SportAccord President at the next election". In his 14-page candidature, Lapasset sets out his wealth of experience in sports administration, which includes a period as vice-president of the French Olympic Committee. Lapasset, IRB president since 2007, played a lead role in rugby's successful Olympic campaign, with Rugby Sevens to make its debut at Rio 2016. His strategic priorities include promoting the positive dimension of sport in society, stepping up the fight against doping and match-fixing and illegal betting and improving services to federations to help improve their governance. of activities adapted to a diverse audience". "My aim is to make SportAccord an indispensible partner for your federations, working with them to develop and grow," he says in his mission statement. "SportAccord needs to position itself as a top-level organisation, providing support to its members and working alongside them, as an active contributor, towards the realisation of mutual and defined goals." Other candidates for the SportAccord presidency have yet to come forward. don’t intend to run,” the Spaniard said. ATR understands that Jan Fransoo, head of the Association of IOC Recognised International Sports Federations, which comprises 32 members, has also been ruled out as a contender to succeed Hein Verbruggen. Verbruggen steps down when his term ends in May at the SportAccord convention in St. Petersburg. Vizer, the International Judo Federation president, told ATR last week that he believed he had the backing of the majority of the 107 Olympic and non-Olympic federations who make up SportAccord’s membership. “Yes, I am confident that today I have the vote,” he said. IF THERE IS NOW AN EXCELLENT TIME FOR UNIFICATION OF ALL KICKBOXING FEDERATION IN THE WORLD (NOT ONLY WAKO) THEN THESE WORDS BELLOW MEANS ONLY ONE THING. TO HOPE THAT KICKBOXING WILL REMAIN UNDER THE NAME OF WAKO? MAYBE? MAYBE NOT? WAKO is in a very special situation since our President, Ennio Falsoni is absent due to illness. It is therefore with split feelings yet with great pride I now try to assist in leading the WAKO organization in Mr. Falsoni’s absence. To fill Mr. Falsonis shoes is for sure a huge task and I can say from the bottom of my heart that we would all rather have him back than have to make necessary adjustments we are currently making under these unique circumstances. It is a huge job and responsibility and I am humbled by the challenges this position brings. Let me make it clear, as announced by our Standing Committee that this is just a temporary solutionbecause we hope and pray for the immanent recovery and return of our President. Martial arts fans from all over the world are coming in anticipation of competitions of the II SportAccord World Combat Games in Saint Petersburg (Russia), on October18-26. But few of them know that on those days, and at the same site not only sports fights but also scientific debates on the consideration of problems of the development of martial arts as well as sports and applied martial arts in the world sports movement will be held. The fact is that on October 18-20 within the framework of the cultural program of the SportAccord Games the VI International Congress “Sport, Human, Health” will be carried out. The congress which is held under the sixth order number this year, in fact, marks its own tenth anniversary nowadays. After gathering leading scientists and experts in the development of modern sports, sports medicine, social and legal aspects of physical training at the first meeting in 2003, the International Congress had been held every 2 years with the participation of sports science stars, and in a short time gained a considerable credibility in the industry. The upcoming meeting in October 2013 sets several objectives. Firstly, the Congress is intended to promote the development of martial arts and combat sports as an important part of the world of sports, a positive effect on the formation of physically and morally healthy society. Secondly, the Congress will help to advocate rapprochement and interpenetration of cultural traditions of East and West, underlying martial arts. In connection with the objectives, participants will have to solve a lot of problems. The scientific program will focus on major themes, stated at the plenary session of the sections Heads. The plenary sessions will follow scientific sections, the time for oral debates and poster sessions. It should be said separately that a report of the International Scientific Group on the results of scientific research: “The role of martial arts and combat sports in the world today, their popularity, the dynamics of development in different countries” will be presented at the Congress. The acceptance of the applications for participation in the Congress and abstracts for publication in the collected book began on March 1 and will run until May 15, 2013. Details can be found on the Congress official website. The Congress will be held in the Park Inn by Radisson Pribaltiyskaya – the largest Congress hotel in Saint Petersburg. The Congress organizers: the International non-governmental organization promoting science and sports “Sport, Human, Health” (Saint Petersburg, Russian Federation); the National State University of Physical Culture, Sports and Health named after P.F. Lesgaft (Saint Petersburg, Russian Federation), the International SAMBO Federation (FIAS) (Lausanne, Switzerland). The Congress co-organizers: Management of the World Combat Games 2013. The Congress passes under the official patronage of the European Council, the State Duma of the Federal Assembly of the Russian Federation, Ministry of Sports of the Russian Federation. 13 sports participated the first edition in 2010. In 2013, two new sports, Fencing and Savate, will join an complete the sports programme. Dear Presidents, Dear Judo Friends, We have entered a new Olympic cycle and we can proudly look back at the past four years that brought progress and general recognition of the value of our sport. We have new challenges ahead and our work for the benefit of Judo will not stop. Together with the IJF Executive Committee, I am committed to ensure the further development of our sport and I will stand again as candidate in the IJF Presidential elections. As you may know, I am also a candidate for the SportAccord Presidency. I have taken this decision with the support of the IJF Executive Committee members and of other International Federations Presidents. SportAccord is the association that gathers all Olympic and non-Olympic International Sports Federations. This candidature is motivated by my the intention of serving Judo and other sports in general, which like us, are striving for the physical, intellectual or moral education of their athletes. By combining Judo with SportAccord activities, I consider that we can bring more values in both organizations. It is a well-known fact that my life has been dedicated to Judo and sports in general and this shall remain unchanged: I am ready to put my time and energy to the service of development and progress of all sports. Thank you for your continuous and valuable support. Another savate french fighter in boxing. Fabrice won in a very weird boxing match.